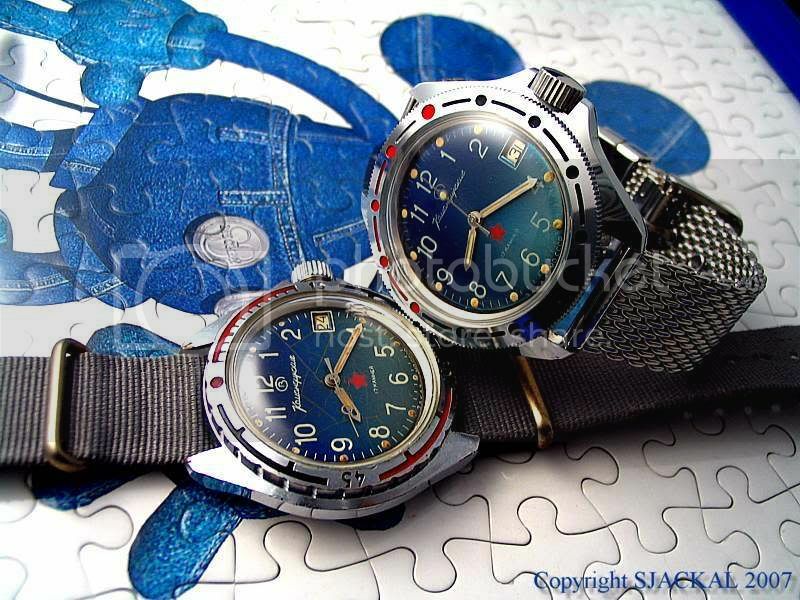 Well here are the pictures of the newly arrived Vostok Komandirskie. It is a 3AKA3 MO CCCP. So what's the fuss about these words found usually at the bottom part of the watch dial? Well Russian watch aficionados will know, it is actually Cyrillic text, which means 'By Order of the Ministry of Defense of the Union of Soviet Socialist Republic'. 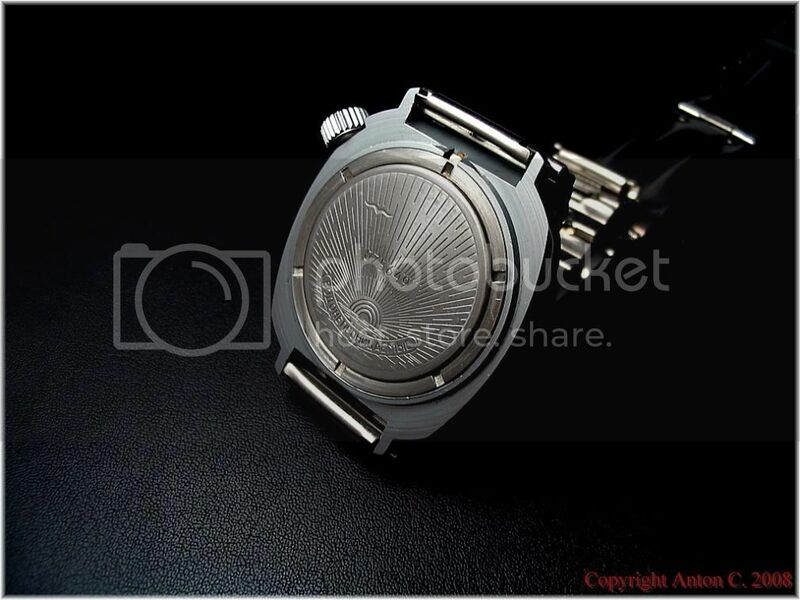 In other words, this means the watch was made under military contract and not available to civilians. The military connection and being lesser in numbers made these more collectible. 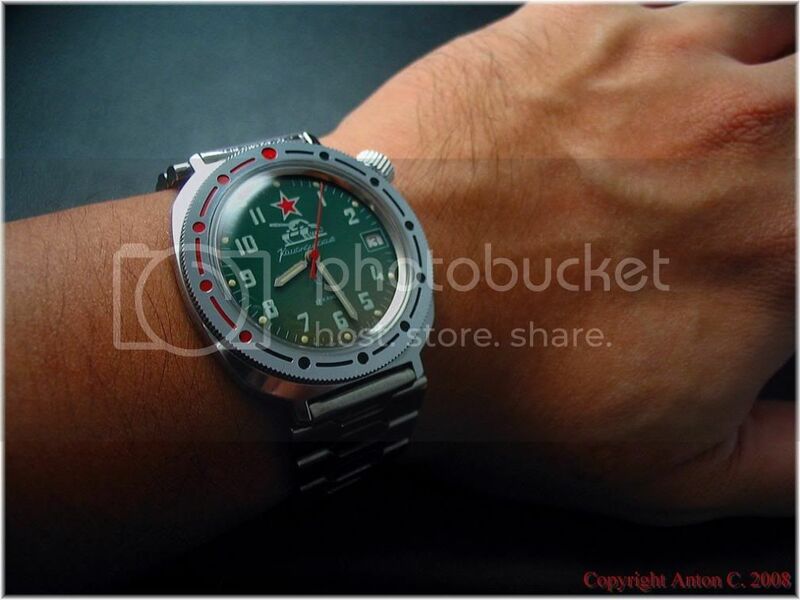 The condition is near mint, my best Vostok so far. I like the more distinctive case shape and also the crown at 2 o' clock. The folded link bracelet is original too but it is not very good because the links are not removable, thus the bracelet is only adjustable at the clasp. Not a big concern for me because it fits just well and I can always change it to a strap. More pictures here. 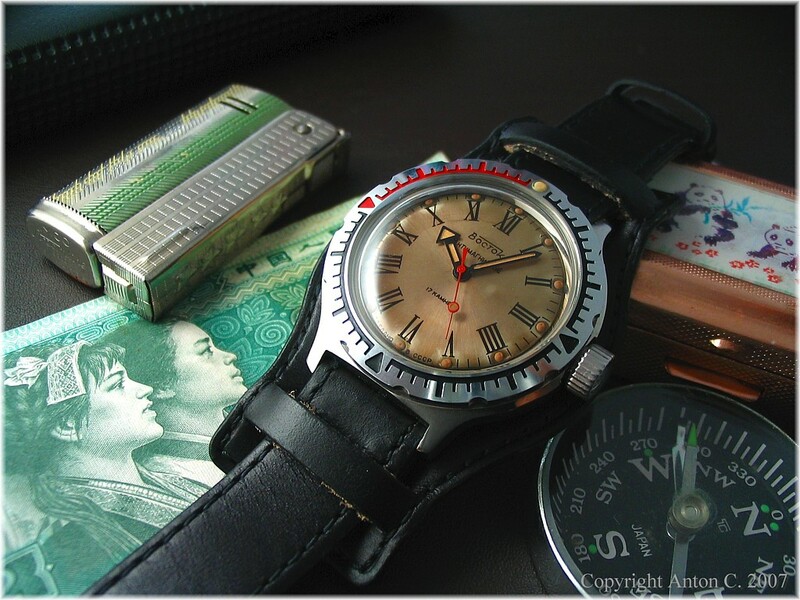 Photographed with another Vostok Komandirskie of mine. Nothing fancy for this piece, no tank, submarine nor paratrooper insignia, just a plain blue dial with a red star, but I like it. Another picture. It is also a 3AKA3 MO CCCP. Well I used to have two of the blue dials. The one on the NATO strap was my first 3AKA3 MO CCCP Vostok Komandirskie. It had a very unique dial which I think its rather rare. The blue dial changes from blue to cyan at different angles of light, and there are gold streaks/veins over the dial. It was truly remarkable, I never seen such a dial before. Anyway I sold this piece sometime ago on Ebay because I wasn't really happy with the condition. 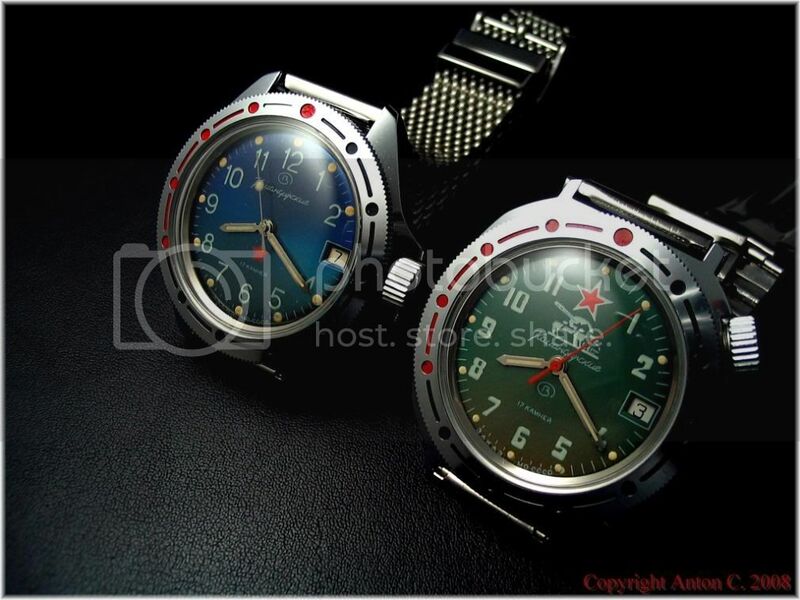 This is a Vostok Amphibian that I also have in collection. Amphibians are stainless steel instead of chromed brass like the Komandirskies, and have better water resistance. Not a 3AKA3, but still from the Soviet era. Now back to the green tank Komandirskie. 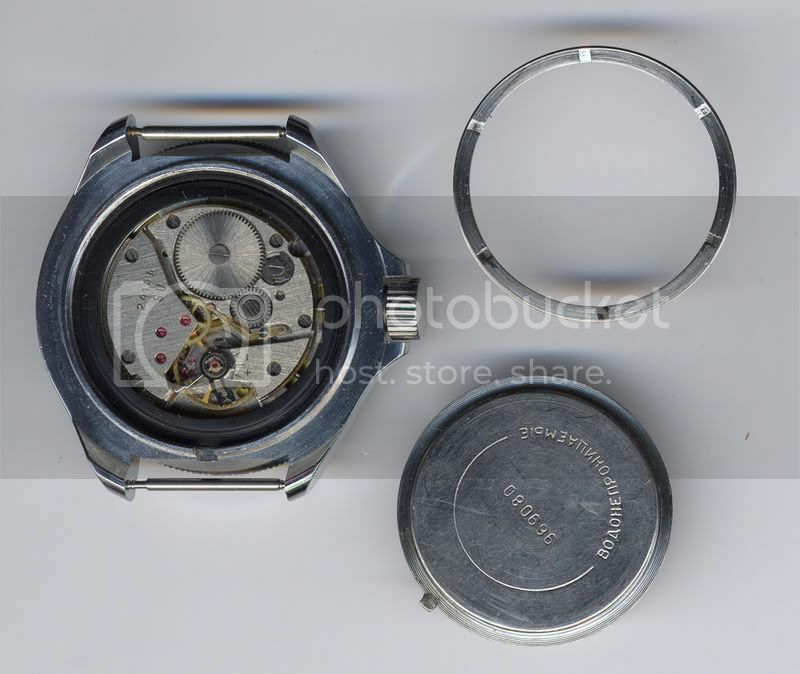 I didn't open the case, but the seller provided me pictures of the watch movement. Unlike older pieces which is marked with SU (Soviet Union) or newer pieces which is marked with RU (Russia), the movement is unmarked. 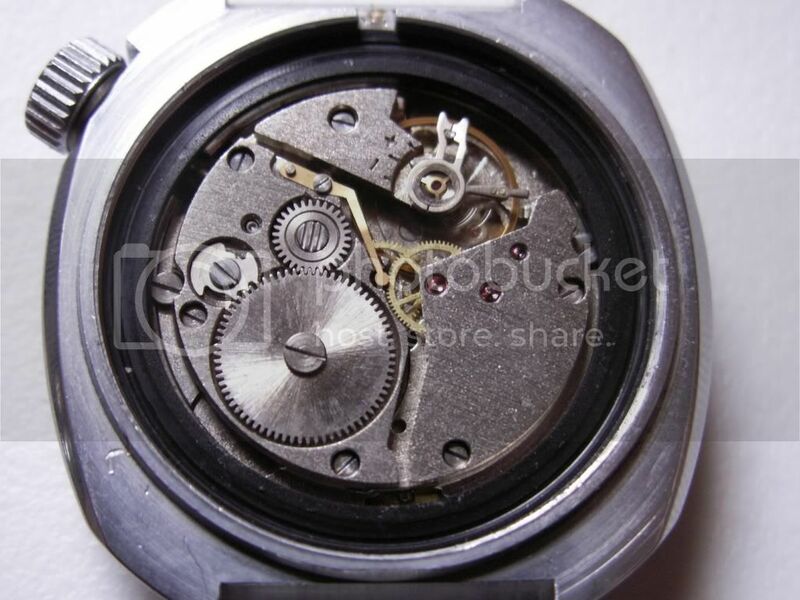 The edges of the movement plate is also flat and not beveled like the older pieces. So I guess it a transitional piece. I reckon this piece is from the late 80s or early 90s, just before the fall of the USSR. Unfortunately I do not have any pictures of a beveled movement for comparison. But you can see it at Dr Roland Ranfft 's website: http://www.ranfft.de/cgi-bin/bidfun-db.cgi?10&ranfft&&2uswk&Wostok_2414A The sides of the movement plate is beveled, or sloped. I hope the read and photos are enjoyable. Nice watches and the pics were nicely taken. Impressive! 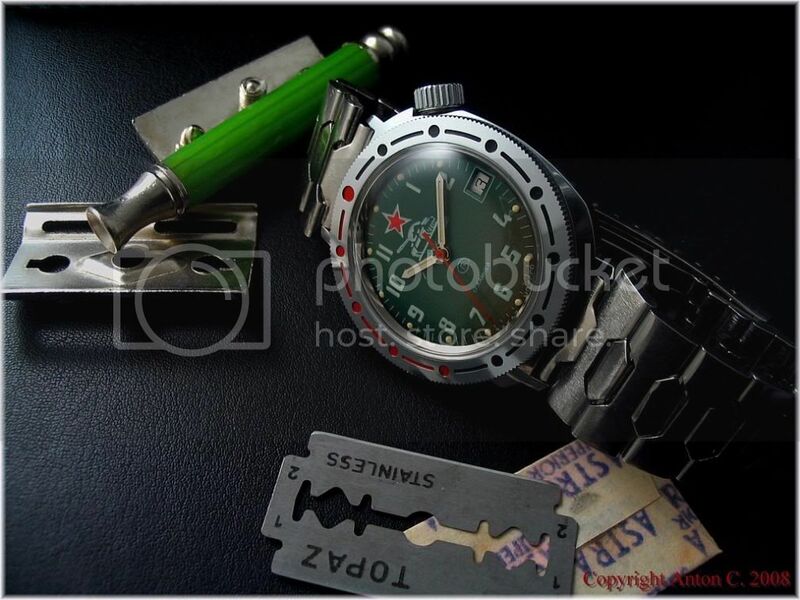 Awesome watches, and great photos. 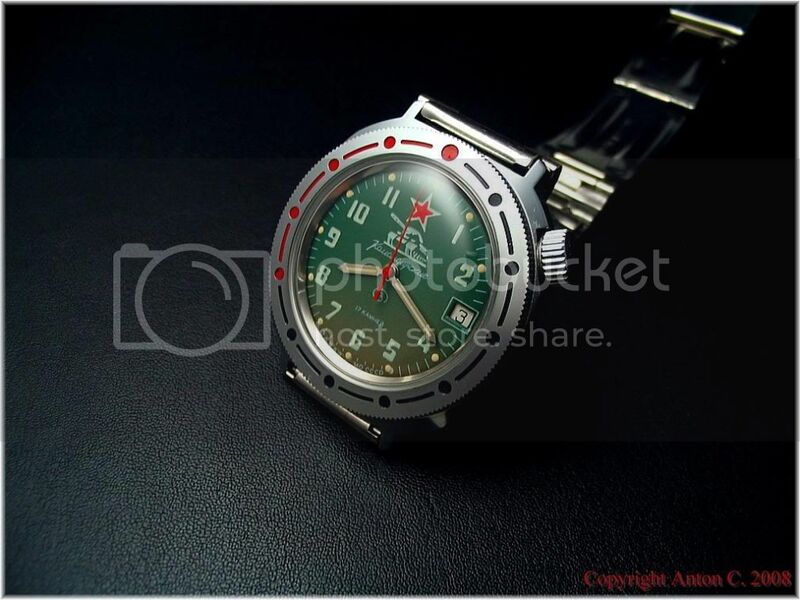 It's definitely feeding my need to find a similar 3AKA3 MO CCCP timepiece. Nice Soviet collection! You have some nice ones. Wear them in health! You can take a mean pic too. Thank you Richard, you sounds like a Soviet watch fan too. All the best to you sir. Yes I am. I have 4 soviet and 3 Russian. Love them all! Cool! 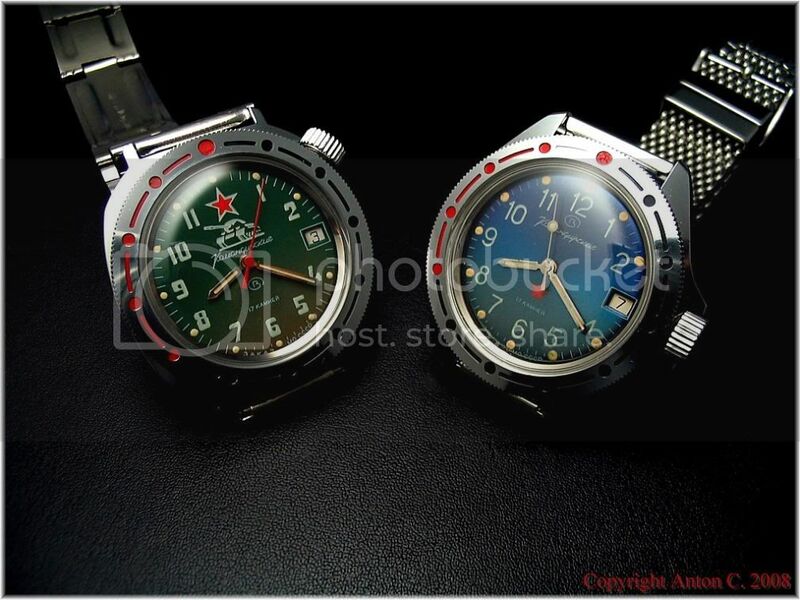 I have 3 Vostok and 1 Strela chrono and another Poljot chrono. Thats less than you! Nice soviet collection! Nice watches and picture were fabulous. Thanx for your compliments Alysha.